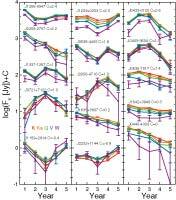 WMAP Five-year Paper Figures, Wright, et al. Map showing the location of the 390 point sources found by searching individual band maps. The shaded region shows the mask used to exclude extended foreground emission. 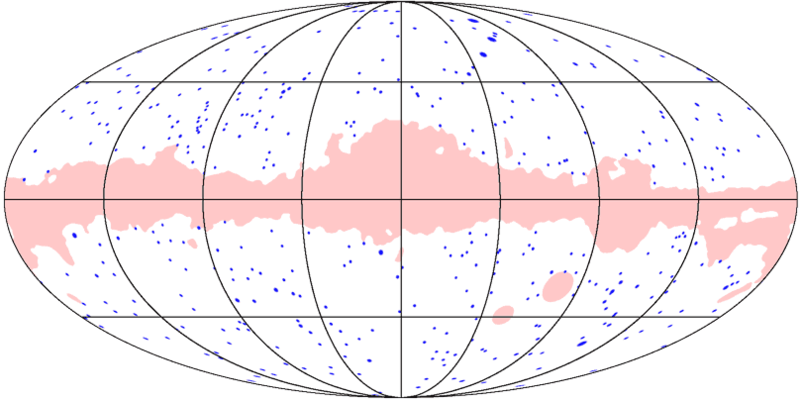 The size of the plotted points indicates the flux of the source: the area of the dot scales like the maximum flux over the 5 WMAP bands plus 4 Jy. 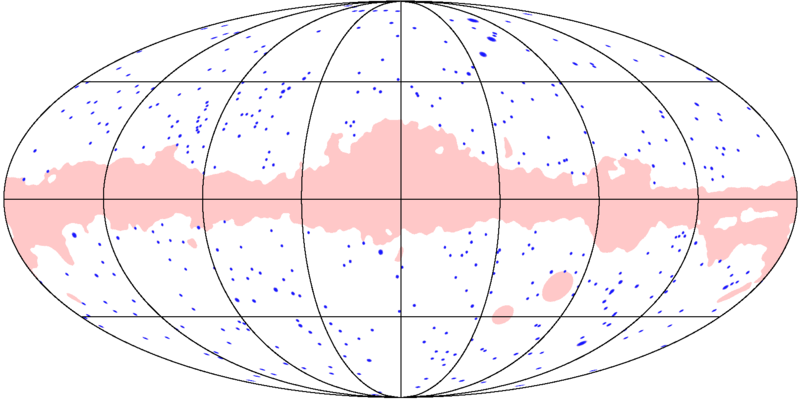 Galactic coordinates are plotted. Differential source counts from the WMAP five-year catalog compared the Toffolatti et al. 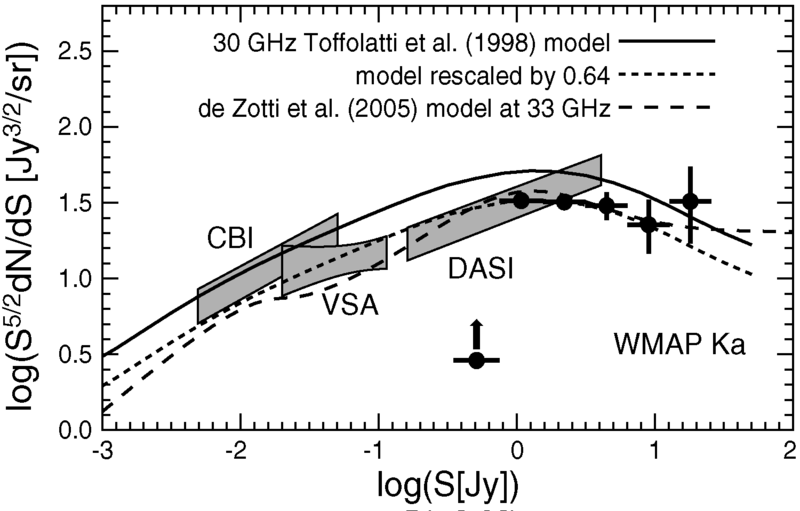 (1998) model, and to CBI counts at 31 GHz (Mason et al. 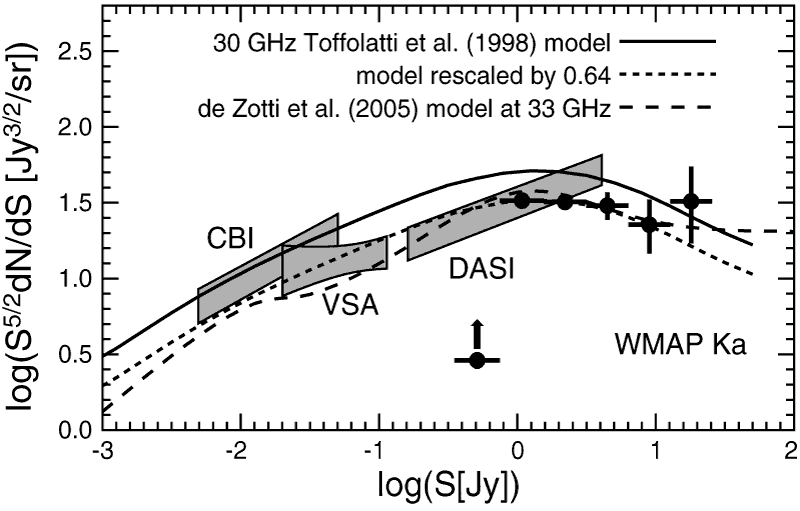 2003), 33 GHz VSA counts (Cleary et al. 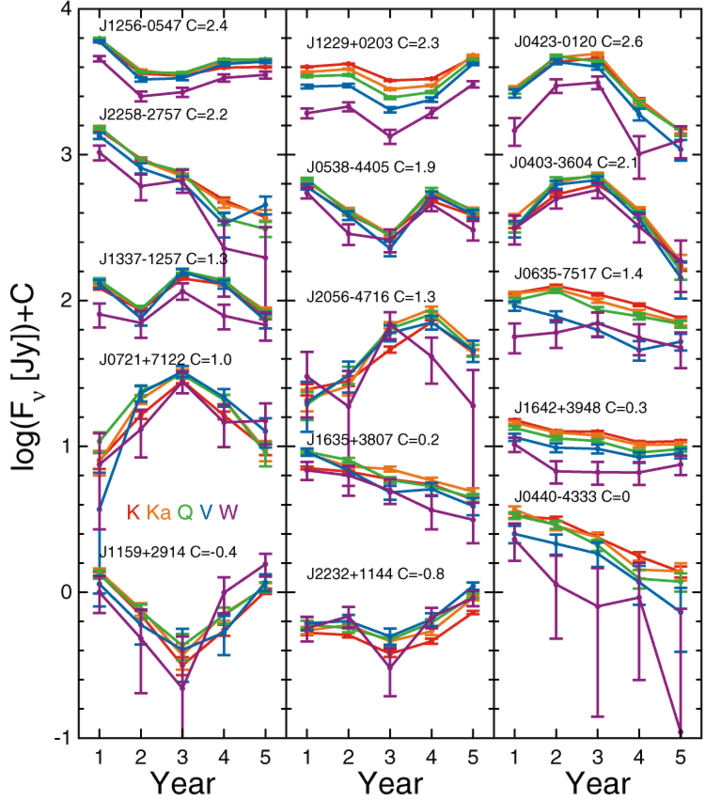 2005), and DASI 31 GHz counts (Kovac et al. 2002). Models from Toffolatti et al. (1998) and de Zotti et al. (2005) are shown as well. Error bars for WMAP are statistical only. The WMAP catalog in the 0.35 to 0.75 Jy bin is quite incomplete, leading to the low data point with the upward arrow on the plot. 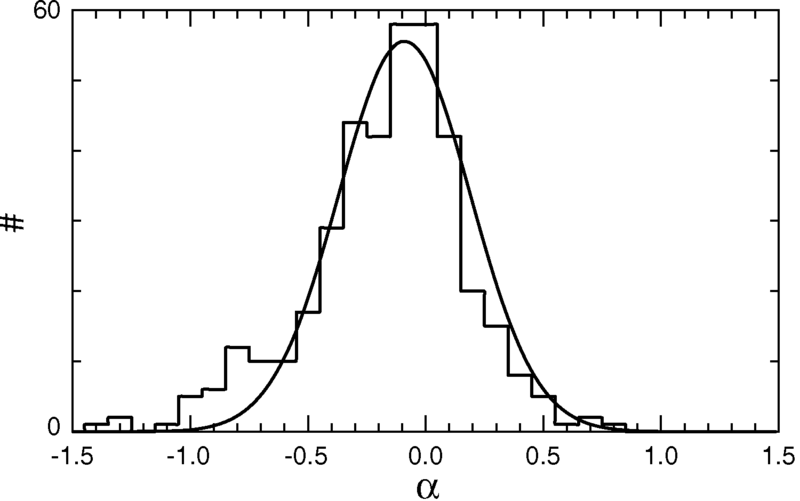 A histogram of the spectral indices of WMAP sources in the five-year maps. The smooth curve is a Gaussian with a mean of -0.09 and a standard deviation of 0.28, normalized to the total number of sources. 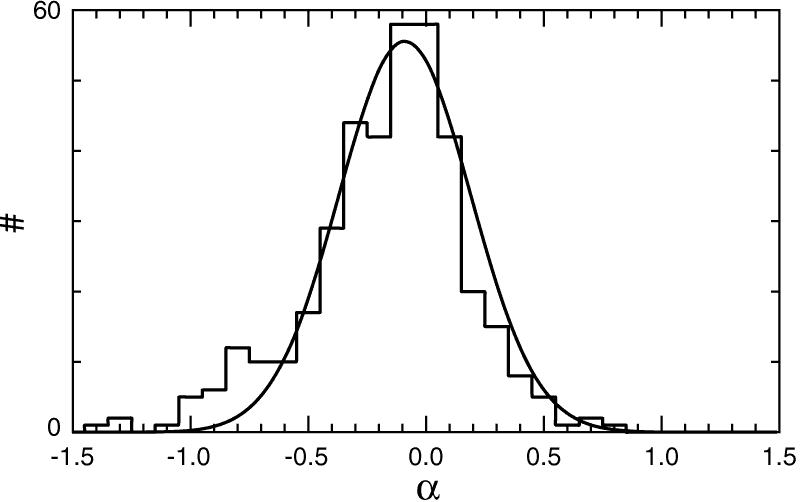 The 15 sources with the highest X2 for a fit of a constant flux with an arbitrary spectrum. The 23 GHz data are plotted in red, the 33 GHz data are plotted in orange, the 41 GHz data are plotted in green, the 61 GHZ data are plotted in blue, and the 94 GHz data are plotted in purple.